Water damage, fire damage, and mold damage can be overwhelming to deal with. The good news is Rainbow International Restoration of South & West Suburbs in Hickory Hills is available to respond to your emergency any time of day or night. 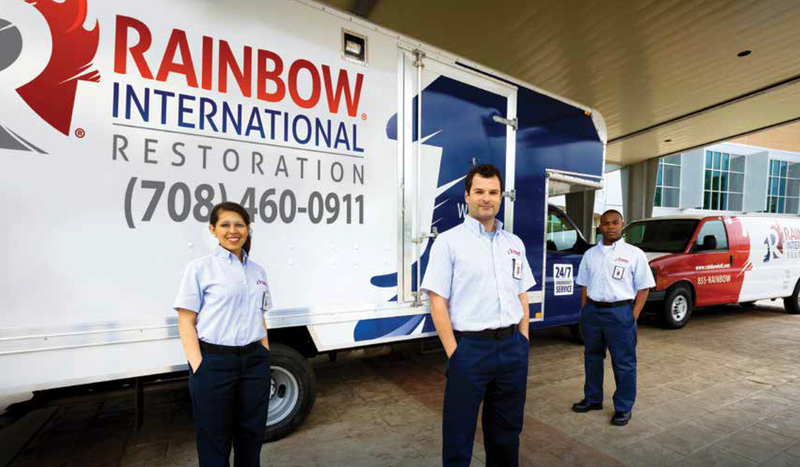 Rainbow International Restoration is a full-service property damage restoration company that has been providing emergency restoration services to Chicagoland business owners and residents since 2007. We welcome you to check out the Photos of our Work! We take pride in accurately managing the complexities of every job and are experienced in handling large losses. You can count on Rainbow International Restoration to assist you with your water restoration, fire and smoke restoration, and mold remediation needs. From water removal to sewage clean up, smoke damage repair to packing out your contents, or air quality testing to mold removal, our experienced team of service professionals are ready to respond. Before attempting to file a claim, clean up, tear-out, or throw things away, contact our restoration service professionals to inspect your property damage and offer a plan of action. Take advantage of our IICRC certified restoration specialists to restore your business, home, personal belongings and your peace of mind. If your personal property or the products that your business sells are damaged, our contents division can pack out these contents and safely relocate them to our secure facility to clean and store them while mitigation takes place. Rainbow International Restoration of South & West Suburbs is a recipient of the Better Business Bureau's Prestigious Torch Award and is a locally recognized leader in the restoration and cleaning industry that services Chicago. Our franchise was featured in a story that made the cover of a well-known trade publication after we assisted a fellow franchise with cleaning up after a large fire. Check out our story here: Three Businesses, Two Franchises, One Goal. We understand that not all property damage is covered by insurance. If your insurance claim is denied or you have a non-covered loss, we have you covered! Because everyone's financial situation is unique, our company has partnered with a distinguished finance company to offer you financing options that can cover the cost of your fire, smoke, water and mold damage cleanup. With financing options ranging from fixed rate installment plans with low minimum payments to plans with no payments and free interest (if the total is paid during the agreed time frame), you will not find a better value than choosing Rainbow International Restoration for your restoration needs. Contact us today and ask how our price match guarantee applies or how you can apply for financing. We’re always ready to help. Call our emergency service line at 708-460-0911, or Request a Job Quote. Act fast to contain flood or water damage in your home or business. Water damage expenses can add up quickly. We have the experience, advanced equipment and rapid structural drying techniques to overcome the worst damage caused by plumbing leaks or weather-related water intrusion. Contact Rainbow International Restoration in Hickory Hills to learn more about our water damage restoration and flood restoration services. Fire damage to your home or business is a disaster that you could never begin to repair on your own. Trust our IICRC-certified fire remediation professionals to complete fire damage restoration properly. Fires are often accompanied by water and smoke damage as well. Contact Rainbow International Restoration in Hickory Hills for emergency service, 24/7. Mold removal is a complex and difficult process. Rainbow International Restoration in Hickory Hills prides itself on being an industry leader in mold remediation. If you suspect mold, do not delay. Contact our IICRC-certified mold removal services to help restore your home or business. We also offer air quality testing to ensure healthy indoor air quality.